Last week’s NFL picks went mostly according to plan, but there were some frustrating beats against the spread related to three overtime game results that weren’t ties. With about a quarter of the 2018 NFL season behind us, picking games should get a little easier as we get a better idea about teams’ strengths and weaknesses. Andrew Luck is doing his best to keep it together with his offensive tackles and top tight end hurting with no running game. But with T.Y. Hilton hamstrung and not looking good to play on a short week, the Colts are much easier to defend. Indianapolis’ defense has played over its head, but New England will beat it up with its running game and a few deep shots from Tom Brady, who gets Julian Edelman back from suspension this week. PICK: Patriots win 34-20 and cover the spread. PICK: Eagles win 23-17 and cover the spread. Patrick Mahomes faces his biggest defensive test of the season at home on a short week. The Jaguars won’t blitz him to create easy matchups and will look to keep him in the pocket and force him to throw more to the middle of the field with cornerbacks Jalen Ramsey and A.J. Bouye. The bigger issue is a Chiefs’ defense that can’t handle Blake Bortles spreading it around and T.J. Yeldon running hard to the perimeter. 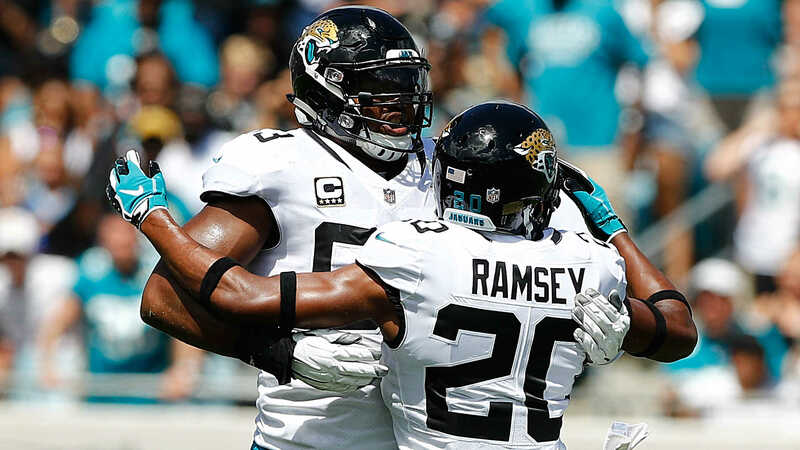 PICK: Jaguars beat the spread and win 24-20 in the Upset of the Week. The Falcons and Steelers are both desperate after losing two straight home games. Both defenses are depleted against the pass and can’t stop either team’s depth at wide receiver and tight end. Pittsburgh is slightly better at stopping the run and rushing the passer, and that will allow Ben Roethlisberger to outduel Matt Ryan. PICK: Steelers win 38-31 and cover the spread. The Bengals are a legitimate new favorite to win the AFC North. Their defense hasn’t looked as good as it should, but their offense has found a new dynamic with Andy Dalton and Bill Lazor. They can also get physical and run the ball if needed. The Dolphins’ defense has a few guys, such as Xavien Howard and Minkah Fitzpatrick, who can make plays, but Ryan Tannehill on the road plus an abandoned rushing attack spells more offensive trouble. PICK: Bengals win 31-17 and cover the spread. The Giants are being too conservative in terms of reigning in Eli Manning and not throwing downfield to Odell Beckham Jr. as much as they should. They are using Saquon Barkley to mask their blocking weaknesses and that can only work to some degree against Carolina. The Panthers will be at home and rested off the bye, and will get Cam Newton rolling early. Their knowledge of the opponent’s Mike Shula offense will pay off late. PICK: Panthers win 24-13 and cover the spread. The Packers are itching to get their running game going and this is a perfect opportunity for bigger returns from Aaron Jones to make it easier for Aaron Rodgers to pick apart the Lions’ back seven. With Randall Cobb (hamstring) and Geronimo Allison (head) hurting, it will be a simple approach with Jones, Jamaal Williams and Davante Adams. The Lions will bring it at home to make it interesting in a high-scoring game, but Rodgers makes one more big play than Matthew Stafford. PICK: Packers win 31-27 and cover the spread. The Broncos will have some success running the ball and Emmanuel Sanders will deliver in a great matchup. But this is a long trip on a short week, and it’s hard to trust a struggling Case Keenum. The Jets will come after him and force some turnovers, creating easier opportunities for Sam Darnold, who protects the ball better this week. PICK: Jets win 23-20 and cover the spread. The Ravens are feeling great about their offense again with Joe Flacco using his variety of weapons well. Their defense is rounding into shape with Jimmy Smith returning and is a tough draw for Baker Mayfield in his second NFL start. The Browns have to be kicking themselves for what could have been in Oakland, and the seat gets hotter for Hue Jackson. PICK: Ravens win 24-14 and cover the spread. The Titans’ offense is better than you think and the Bills’ defense is better than you think. They’ll meet somewhere in the middle here. This is a chance for Tennessee to play ball control with Marcus Mariota and the running game to stay away from Buffalo’s strengths in pass defense. Josh Allen can channel some of Carson Wentz’s success against the Titans’ defense, but it won’t be enough. PICK: Titans win 20-17 but fail to cover the spread. Derek Carr and the Raiders’ offense showed its potential when Amari Cooper, Jordy Nelson, Jared Cook and Marshawn Lynch are involved in the right ways. The Chargers’ defense gets a little better against the run with Corey Liuget, but no Joey Bosa keeps them vulnerable against the pass. Carr and Philip Rivers should be comfortable to chuck often, but given what we’ve seen early, it’s easy to give Rivers more trust. PICK: Chargers win 30-27 but fail to cover the spread. This is a pretty bad matchup all-around for Seattle. The secondary doesn’t have enough answers for the Rams’ three game-breaking wideouts without Earl Thomas, and that’s a huge advantage for Jared Goff. The Seahawks also have had trouble with elite feature backs Ezekiel Elliott and David Johnson, and that continues with Todd Gurley. Offensively, with Russell Wilson behind a line that can’t stop Aaron Donald, it also will be a rough afternoon at home. PICK: Rams win 33-23 and cover the spread. The Cardinals have a good shot at getting their first win here, but there’s still not enough pop in the passing game for Josh Rosen to exploit the 49ers’ struggling and hurting secondary. Arizona’s run defense is the bigger issue, as San Francisco gets it done with a committee to complement C.J. Beathard’s short-to-intermediate passing game. PICK: 49ers win 20-17 but fail to cover the spread. This Lone Star affair becomes a little ugly with the Cowboys’ and Texans’ pass rushes making it tough on both Dak Prescott and Deshaun Watson. The Cowboys‘ secondary will give up some big plays to DeAndre Hopkins but Prescott has the steadier source of production to support him with Ezekiel Elliott and a far superior running game. Jason Garrett stays cool while things look worse for Bill O’Brien in prime time. PICK: Cowboys win in an upset, 27-24. Drew Brees gets the spotlight as he needs only 201 passing yards at home to break the all-time yardage record. But the Saints’ running game is revving up again with Mark Ingram ready to join Alvin Kamara and make this team look more like last season’s version. Washington comes out ready after a bye, but New Orleans puts together a complete victory to add to the Brees’ celebration — as if the city needed another reason to party. PICK: Saints win 27-20 and cover the spread.